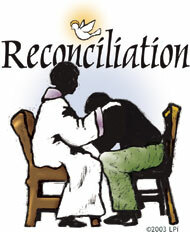 “Those who approach the sacrament of Penance obtain pardon from God’s mercy for the offense committed against him, and are, at the same time, reconciled with the Church which they have wounded by their sins and which by charity, by example, and by prayer labors for their conversion. Each Saturday Evening before Mass (6.30pm – 6.55pm). Before Mass on the 1st Friday of the month (7.00pm – 7.25pm).